I have not wanted to tackle this subject because of the controversy it might ignite, but in light of eBay's recent Gestapo-esque actions, I think it's time to clear up a few things, once and for all. 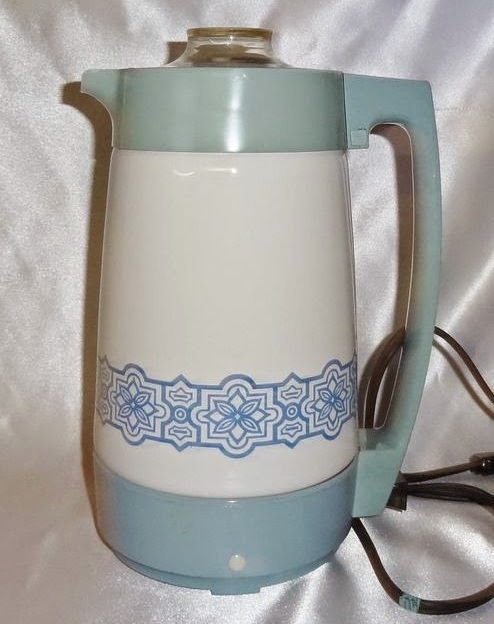 So before you, as a buyer, decide to "report" a seller's Corning Ware Percolator listing to the ePTB (eBay Powers That Be) you better be darned sure that you have identified the percolator correctly. Before I begin, let me first states that.... Regardless of the recalls (and I use the plural because there were two) these percolators are still a Collectable Item. I, myself, who cannot stand percolated coffee, own 19 percolators of various models and patterns... (How's THAT for irony). I hardly ever use any of them, though I occasionally use my P-280-EP as a water boiler. (which was a recalled model BTW). The point is, that they are of paramount importance to collectors, intact. It was brought to Corning's attention in 1974, that there was an issue with the E-1210 Electromatic 10 cup Percolator. The metal collar, which was attached with Epoxy, had a tendency to separate from the pyroceram pot after repeated heating & cooling cycles. Corning stopped production in September of 1974, redesigned the pot at the attachment point, improved their epoxy curing procedures, then returned the model to production. But, by 1976 it had become apparent that the issue with these pots was a little more wide spread than originally predicted. So, Corning issued a recall for the E-1210. ONLY for the pots made before the redesign. How do you tell if you have an E-1210 that is safe for use? There is a number etched on the metal band to the right of the handle.... The numbers vary slightly, but ANY number means it is NOT a recalled pot. I will repeat, NOT a recalled pot, NEVER was and NEVER would be, as you will see. Production of Percolators dwindled off in 1978... 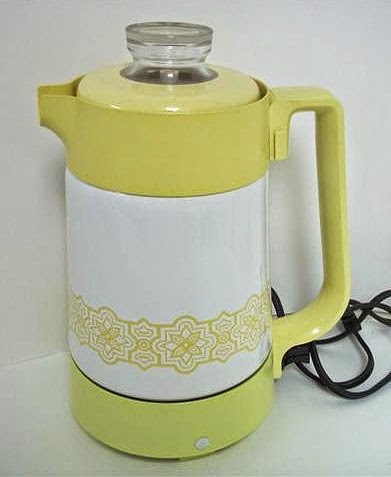 Simply because the auto-drip coffee maker had taken over... After all, America was gearing up for the 80s and it was all about instant satisfaction... Programming your coffee brewing to begin 15 minutes before your alarm went off so you could "tumble from the bed, stumble to the kitchen" and immediately "pour yourself a cup of ambition" was much preferable to setting up, and waiting for, the percolator while staring blearily at your newspaper. By 1979, as more reports of separation came in, it had become apparent that the epoxy problem extended to more than just the E-1210 pot. Thus, in September of 1979, a larger recall was issued, encompassing 1961-1976 models (almost every model manufactured prior to the redesign of the E-1210 in 1976) This recall encompassed not only the Electromatic Percolators, but the Stove Top models as well. This is the Recall that gets a bit tricky.... Here is the list of the dangerous percolators. Let me give you more of a visual, since most percolators don't have model numbers on them. The P-119, P-129, P-139, W-119 (9 cup Stove Top - Cornflower, Trefoil, Wheat) and the P-116, P-126, P-136, W-116 (6 cup Stove Top - Cornflower, Black Starburst, Trefoil, Wheat) all of which look like this. This also includes several other patterns that did not receive special model numbers such as 1st edition Floral Bouquet from the 1969 Limited Edition gift line as well as the Avocado Medallion released to accompany the Avocado Round. P-80-EP, P-280-EP, P-480-EP, W-80-EP (Cornflower, White, Platinum Filigree, Wheat) there were several other patterns that fell under the generic P-80-EP model number as well.. Such as the 4 special percolators French Spring, Tropical Summer, American Autumn, Nordic Winder, Mallard Ducks, Early American Black Eagle, Avocado Medallion, 2nd & 3rd Edition Floral Bouquet etc. I have not been able to find any reference, aside from the documentation above, to a P-176 or P-179 Percolator. Thus I have no photos. Here is the list of those NOT recalled. There are only 4 Corning Ware Stove Top models and 1 Centura Stove Top models on this list along with the redesigned E-1210 and the 4 weird looking Electromatic Percolators. Hopefully this finally clears up all the confusion. Oh, one more thing. Corning Ware Consumer Products Division no longer exists. The Corning Ware name is owned by World Kitchen, LLC. They have nothing to do with either of these recalls. Please do not attempt to call their customer service and ask about refunds or returning these pots. Where is your Corning Ware (Percolator)?? I have a recalled model. What do I do with it? I was going to sell it on Etsy, it does not have a cord. It was in a box of Corningware I bought at an estate sale. Is it just trash now? Thank you. Remove the band and handle and use it as a utensil holder. My electric percolator , Spice of Life, is king of the counter top. I use it daily, sometimes twice. I wash everything but the cord in the dishwasher. I do not see any handle issues. The issue is the power cord. It almost doesn't exist. I am looking for a complete, cord included. It is so pretty, and makes great coffee, and so easy, I just can't let it go. Neither could my mom in the 70s. She bought a spare. Since it doesn't have a cord, you might be able to list it as "for Parts" on eBay, but chances are, it will still get pulled. Thank you Shane. Fortunately, it was not an expensive box of Corning so loss is minimal but still, just a case of taking a chance for resell. P-106 was also made in Spice O' Life pattern. I have an image but don't know how to upload to this message. P.S. The P-106 that says "Le Cafe" (The Coffee) is not the same shape as the P-106 shown above in Cornflower pattern. I just got a P-106 with "Le Cafe" on it. It is a 6-cup. I just sent you a photo! 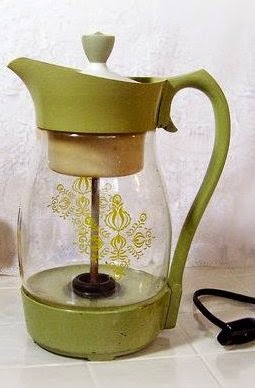 The original P-106 percolator was discontinued in 1960, however, in the 70s Corning Recycled the Model Number and released a P-106-N pour over drip coffee maker. Sadly the "N" is missing on the pots themselves... which is confusing. These drip makers came in Spice O' Life, Country Festival, White, Wildflower and, of course, Cornflower. Interesting! You do know your Corning Ware! Well, I really like the P-106-N then. I like its shape (not so squat as most of the others that have curves). Sorry to have separated this into three emails! I have a question: Why are some of the above called "stovetop" models when they are made of pyroceram and therefore all could be stovetop (except for the electric ones)? Is it only because they were labeled as such -- or is there a reason a person should not put one of these non-electric pots on a burner? Thanks!! They were originally sold by Corning that way. My assumption is that the use of the word "Stovetop" was to differentiate from those that were Electromatics. Thanks for the explanation. I get confused easily with all of this at times! Please forgive me if I am being thick-headed, but would a 1975 P-145 10-cup pot be one of the pots in danger of the top coming loose? (I know it is 1975 because it is with art work with the two bluebirds and that is dated as 1975.) Thanks! Sadly yes.... All the Country Festival Percolators are on the recall list.. Mainly because the pattern had been discontinued before the fix was made after the initial recall of the E-1210. The eBay Gestapo does not acknowledge the handy reference you show. They only read the Consumer Product Safety Commission recall notice to you. Unfortunately, the recall notice was not specific enough for the eBay customer service reps. They told me I needed to call the CPSC and tell them to update their recall notice. Yeah, right. I think the CS rep was born long after the recall and was trained to just read the script to people like me who complained that their non-recalled pot listing was canceled. Then I got stuck in a do-loop and wasted a lot of my time arguing with a CS who clearly did not understand the issue. I'm guessing English was not his primary language, so there was another challenge to deal with. Good luck! My Corning 10-cup has no model number and no number on the metal band. How do I determine what model it is? I have the 10 cup with no model number, no number on the metal band. I still love it! I am just real careful about how I lift and pour using it. I use a pot holder in one hand and make sure I have it under the pot so that there is no pressure on it. I have had this for 47 years! Works great. The reason it makes good coffee (I roast my own, grind my own, etc.) is because it perks almost immediately while the water is still cool. I love all my 4 Corning Ware Corn Flower pattern Percolators. I use 2 of them for percolating chicory and spices(I can't have coffee). I read all your info, I plan to continue using them (nothing is like Corning Ware), but will keep an eye on the epoxy for leaking or coming apart. I don't think they will cause any danger. I think if one does come apart while I am percolating with it, it will be just be like a pot that over boils, in that it will spurt, splatter, hiss and make noise, till I turn it off. I don't think it will suddenly all fall apart and cause a major catastrophe. Just like with anything that one cooks, there are dangers. I have 2-9 cup Corn Flower Pattern Percolators with no numbers on it. I have 2-6 cup Corn Flower Pattern Percolators with no numbers on them, BUT 1 of them has an interesting handle on it. I originally thought it was a little weird. It has screws and bolts holding the handle on to the stainless steal lip and band, it was definitely done in the factory. You know how well thought out Corning Ware products are, you never see a screw or bolt, they make them seamlessly beautiful. Could this be one that was sent back to Corning for the Recall and was repaired or replaced? I can send you a photo. I need a cord for my 10 cup electric. Can I use an after market one ? It depends on the Model number of your 10 cup percolator. There are 3 different models of 10 cup. The P-23-EP used a P-13-HC cord originally, but the prong set is that of a standard appliance cord that can usually be purchased at a local hardware store. Ace Hardware #30123. The other 2 models (P-80-EP and E-1210) both take a proprietary cord. (also used for the 6 cup P-6-EP) For these models, you will have to either find a replacement on eBay or Etsy (P-6-HC or E-1210-HC) OR you can purchase a manufactured copy from Classic Kitchens & More online store. I'm going to check Classic Kitchens. This is very helpful. No issues at all with the percolater , but the last cord was $40. Glad I got it. As of this evening I am a proud owner of an E-1210! Helping mom go thru my grandma's stuff that's been in storage since 1985! It was marked at $2.00 for an '85 yard sale shortly after she passed. Thank god nobody bought it! It has no numbers on it so, as stated above, I will be very careful with it. I noticed you used the words "excessive heading and cooling". I think I can avoid that. How are all us "being careful" users making out by now? I love percolator coffee and I can't wait till tmro morning! Thank you very much for the every so valuable information! I have a 10 cup P-80-EP which we have used for several years, it was my mothers, we love it; our cord recently burned at a critical place that was not repairable. We are having a hard time finding a replacement cord. It will be sad to not be able to use it anymore. Still hunting for one. I also have an E-1210 but no cord or lid. Ebay is expensive. Oh snap. The word was "repeated" not excessive. My mistake. Hopefully I didn't hurt it with the three cycle baking soda/vinegar cleaning process. I have tried sending a question before and am having a bit if trouble. Have you ever seen a Corning ware percolator that is the 6 cup teapot on the bottom with a clear glass part that fits on top? It has a stainless steel lid and I didn't see it in any of your photos. 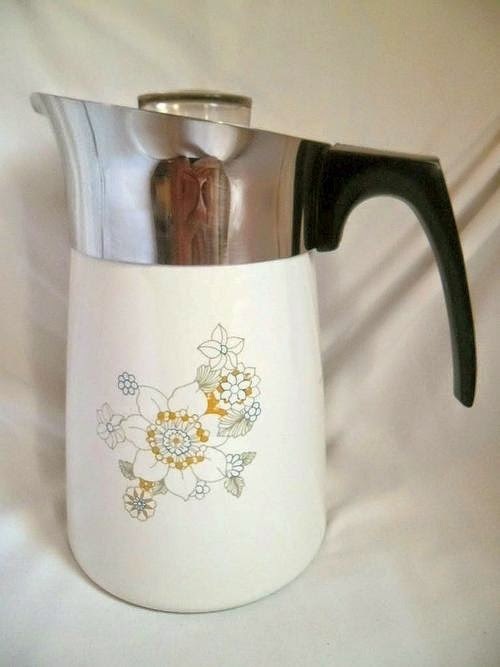 I've got an electromatic trefoil percolator and ebay pulled it and etsy won't let me list it. Sigh. I tried it, it works! Any ideas on where to sell? I think the easy way to tell is to imagine that the steel band at the top became unglued. Now imagine picking it up by the handle. If there is any chance the band will come off because nothing WIDER is above the steel band, then it is very likely recalled. In some of the pots the neck over which the band sits is cinched-in (as the waist in an hourglass figure is cinched in) compared to the pyroceramic both below and above it--and that is when you know you are safe even if the glue gives out. And it was a glue issue, as I understand. I have a question about my corning coffee pot. It is a CORNING Heat-Proof Glass Coffee Tea Pot Atomic Gold Star Burst 6 cups. This isn't one of the ones recalled is it? Thanks. I would post a picture but don't see how. Heat-Proof glass is different from the Pyroceram that the Corning Ware Percolators were made from. So your Coffee pot should be fine (sounds like it's made of Pyrex Glass). The Pyroceram itself was not the problem with the Corning Ware percolators, it was the attached stainless steel rim that was the cause of the recall. Today I bought a cornflower 9 cup stove top percolator for $20 at a local antique/consignment/junk shop. It's been there for months and I finally bought it just to add to my small collection. It looks like it's never been used. No coffee stains or tarnish on the metal parts. It has no model number and has a metal pouring lip. Then I found this recall information. I don't plan to sell it, but it's good to know to be careful with it. I have a Corningware 9 Cup Stovetop Percolator in the Renaissance pattern. I don't see a number on it. Is it recalled as well? Yes, sadly. The Renaissance percolator is a P-149 with a stainless steel rim, so it was recalled. I am a little confused about the comments saying that eBay pulls listing for recalled pots. I just bought one. Re eBay: I'd say they let it be sold either because (a) no one reported it as recalled during the auction, and/or (b) as Shane said, even though they are recalled they could be items desired by collectors. Thank you for putting together this info. True to the usual ePTB behavior, they're very sporadic in the enforcement of their edicts: their attention wanders, and if new auctions fail to attract their attention, the sales continue. Currently there are a good number of Corning coffee pots of all types up for auction or sale, and that will continue. You know, until Someone notices, and then they'll get yanked. That is SO true.. I, myself, just managed to snag a P-80-EP Electromatic off ePay a couple days ago. Luckily is was a Buy it now listing.. Those seem to move fast enough that the ePTBs don't have a chance to catch them and remove them before they are sold. I was going to save embarrassing myself by asking, but after searching the net and coming up with three definitions that could not possibly apply, I must ask: what does ePTB mean? The pattern is a blue (like the cornflower blue) Genie Lamp, like Aladdin's lamp. Do you know the name of this pattern? Haha! :) The Aladdin sounds fun. Thanks for the confirmation, I just have never seen it and could not find any info out there. My Mom and dad have a E 1210-8 10 cup Electric Percolator. Most likely a recalled one, but they don't really care. THeir cord died yesterday and I am wondering if an Electric percolator can be used as a Stovetop Percolator. Or is there something that would make this not work or would ruin it. You can use an electromatic percilator on the stove, however, the immersible heater element must be removed. Since the pump stem for the Electromatic percolators is designed to fit into small depression in the electric immersible heater, and will not "stand" in the pot alone, the internal workings will need to be replaced with a normal stove top style pump and basket before using it on the stove top. I have been using my mother's E 1210-8 10 cup Electric Percolator as a stove top for the past 10 years after the heater element died. I did find that a Faberware brand style pump and basket from a dead Faberware electric perculator I bought to replace the E 1210-8 fits nicely (Faberware perculator only lasted 2 years, so that was when I converted the E 1210-8 to stove top use. For the E 1210-8, is there any specific stove top model/size pump to look for? Will the unit need a new top lid? Yes! Thanks That makes perfect sense. Now im on the lookout for a pump and basket. We all love their percolator coffee! I just listed on eBay yesterday the Blue Cornflower 8 cup P-108. When I checked my account today,I saw it was sold already.I had it listed as a Buy it Now for 24.99. Someone from Canada bought it, I'm in PA. No sooner after boxing it up to ship it, eBay calls me and says that this wss on a recall list from the 1970's and that my listing will be pulled. I didn't say that it was already sold but now wonder if they will pull money from my PayPal acct to reimburse the buyer. Truly believe their rules are crazy. eBay gets a little over zealous sometimes. I have noticed, jut in the last few days, that multiple percolators were pulled from listings (I watch a lot of them). They are wrong, of course. Your P-108 was not on the list. If the sale has been completed, they will delete the completed listing, but since eBay and PayPal were split, tere isn't anything they can do about the paid transaction. I have had this happen to me as a buyer. 24 hrs after purchase, the completed listing is removed. Thr buyer will have to track it through PayPal instead of eBay.... On thr plus side, since they removed the listing, you may not have to pay the eBay fees.... Not sure about that, though. Hello! I just acquired a 10 cup Floral Bouquet electronic percolator. I am saddened learning about its recall even after obsessively looking on the metal band for the 3 digit number. It wasn't there! I percolated some coffee after thoroughly washing it out well and loved it. I will just be careful when pouring by holding the bottom of the coffee pot and tell my family and friends to do the same. Such a great piece to have! Thank you for this info. I just picked up a Tropical Orange Flower 10 cup electric percolator at an estate sale to sell on eBay, I was looking for a cord here and found this thread. I would love for a collector that would appreciate it to have this. Can anyone contact me here? I just listed the "guts" on eBay and will more than make up the estate sale cost. I am updating my post from above. If anyone wants the outside, I hate to throw it away. I would just want to cover the shipping as long as I know I was not putting someone at risk of being burned. Most collectors want them just for display purposes (I have the whole set of 4, myself) It's a bit of a hassle, but if you are on Facebook, there are several Corning Ware collector groups that allow for selling of these pots. I have purchased one of the original blue cornflower 10 cups that were recalled and now I found out why it was at goodwill: the top leaks! (bad epoxy) After cycling it a few times I was able to finish it off (break it on purpose) and get the top off. I am gonna try sanding off the old adhesive off the plastic and using a two part food safe adhesive to glue it back on. What do you think of this kind of repair? I guess I will find out if it works very soon! I would be interested to know if it works. The only problem with these was the adhesive giving way over time.... If they can be fixed with a newer epoxy, that would be stellar! I have a Blue Cornflower 10 Cup with no model #. Bought unused at a yard sale for $2! Have used daily sometimes 2 times a day every day for past 8 years. Well, the cord is starting to act weird at the prongs. Will the Ace Hardware replacement #30123 work for my model? I love this pot, it makes the best cup, is fast and I am so glad I came across this page so now I know to handle it with more care and two hands and a pot holder! When do you think this pot was made? I was thinking around 1970ish. Thanks for your help. God Bless! I have a 10 cup E-1210 electric percolator with the 3 digit engraving. My lid is Corning but not correct for the E-1210 and I'm missing the trivet. What Corning percolator lids and trivet that fit the E-1210 properly? Thanks. The trivet for the E-1210 is actually marked as an E-1210-T, and should be available on eBay. The lid will be a bit more difficult, as it is not specifically marked as such. Your best bet is to look on ebay for an "E-1210 lid". Booooo I think I just bought one of these recalled ones yesterday at a garage sale. I have to go check the numbers. Thanks for an informative and helpful article! Your blog is absolutely priceless to me and I appreciate it so much! I picked up my first 9 cup stove top yesterday. Had no idea about the recall. Oh well! I'm just happy to have it. I just brought a Corning 10 cup E 1210 missing the plug and coffee holder part :( i wasnt paying attention. Where can i get those parts? Is it possible to turn a stove-top model into a electric if you buy the heating element? Sadly, it is not. The electromatic percolators have a hole in the handle where the socket for the element sits. The stovetop models have a solid handle. Thank you for this article. I have two E-1210 percolators on ebay. I will pull these items immediately. I have a rangetop Spice of Life percolator, P-149-8. The numbers inside indicate a 6-10 cup capacity. Was this recalled as well? What does the final "8" refer to? Thanks for great information. My P-149-8 inside looks like 1-6 . Would this be different to the above comments from Meade bollard ? I have a 1959-60 8 cup peculator and Ebay keeps taking down my listing, even though I posted that this was not a recalled model. I see one sold on Ebay for $149 and I'd like to sell mine for that amount of money too. Problem with Ebay is that CS agents are in Asia and don't understand English at all. Sorry, I can't help you with eBay customer service and their misunderstanding of the recall, all I can say, that may soften the blow about eBay being on your tail, is that that $152 percolator is a fluke. They must have gotten into a bidding war it something, they usually sell for around $40-50. Can anyone help me identify the year my plain white model with product name stamped on the bottom is? I would need to see pictures of it, and the stamp to know for sure. I just bought one on EBAY and two days after it was delivered I realized that it was a recalled stove top. How is this possible that they allow these to list knowing they may endanger the public. It's not just mine that slipped through the cracks there is at least 50 current listings on the site as I type this. eBay's diligence in removing the recalled percolators seems to be sporadic... I have noticed they tend to be more on top of the rare pattern ones than the more common blue cornflower... I believe part of this is due to the fact that some of the Cornflower percs are not recalled and it confused the average eBay agent.. and they have removed safe pots as well, on occasion. Another issue, is that they are still a collectable, even though they were recalled.. I myself have 30 some odd different patterned recalled percolators, for display. This is the pot I have just purchased on ebay. Made a great pot of coffee in it today. Learned of the recalls and was wondering about this pot. Not seeing the number listed on recalls or in any of the messages. Thanks for the info! I came across this page by accident. I remember the recalls on the corningware coffee pots. I also remember my parents taking cracked and crazed corningware pots back to the retailer. If memory serves me correctly, there was some warning and recall having to do with the corningware itself becoming cracked and breaking (not simply the stainless steel band and handle coming loose from the pot). After several returns, the parents found one pot, a P-80-EP with the blue cornflower pattern, which DID NOT start cracking after only a short time of heating cycles. It was at this point that they were made aware (or perhaps made aware again) that the stainless portion would possibly separate from the corning ceramic portion. That was it: It was not long after this that they made the call to not use the pot again (I'm sure this was before 1980). Today, I went to the basement and found where it has been stored. Yup, it hasn't been cleaned since its last use. No cracking of the finish. The handle and metal band are quite solidly attached. The cord has not decayed. I plugged it in. The water warms quickly and is 'perking' sans coffee. I believe the light on the handle glows when the coffee is done, so as I write this, I am simply waiting that moment. Wondering how much it could be worth to a collector? I remember that mom and dad did not want to shelve it, and did not want to throw it away simply because the coffee was so good. But they soon became accustomed to their Mr. Coffee (which we still have - I'm a little surprised how many coffee makers, and thermos bottles we have after having searched for this Corningware pot). Hi, I was trying to find out more about the corn flower 9 cup stove top percolator I bought a few years ago at a garage sale when I came across this site. I actually opened the top tonight and looked inside of it since having it for almost 3 years. I'm glad I found out about the recall on it but I still would like to try it out. But I have a really dumb question. I'm not a coffee drinker but my friends are and I would like to make them some but I don't know how to use the darn thing! Any advice or tips? Shane, you sure have a tremendous wealth of knowledge regarding these percolators. Does both the 9 & 6 cup stove top units have 3.5" filter baskets? Thanks for all the great information on the Corning recalls. I just picked up a 9-cup stovetop percolator today for $5 at an estate sale. It doesn't have the little number by the handle so I guess when I use it I will have to hold the bottom with a thick potholder!! I have about 12 of just the 9 cup stove top percolators. I'm a collector, I don't know what it is about them, but it is one of the few things I collect. And, more odd then that I have problems drinking coffee, so I use them for Chicory and making allot or herbal teas and brews. I have one I have used for almost 25 years. I never had one issue in using any of them. They are always tight and easy to clean. I put all of mine in the dishwasher, almost 20 of them in all. Perfect and beautiful! Almost everyone with a coffee filter basket. I keep all of them clean and pristine when not in use. I do have one with a defect, I think from the factory, the metal top was glued and not centered corectly, maybe it will be worth something someday. I have found no ID numbers on any of the 9-cup size. I have found numbers on other sizes. I think when Corning issued the recall, everyone just put them away and never used them. I find many in new condition or excellently clean. Never had any of them come apart, or even look like they had any problems. It's hard to find them, ebay and many thrift stores won't sell them because of that stupid recall. But, as you know, I love them! I have a stovetop one that is a recall. I haven't used it yet because I think it might need a diffuser under it as I have an electric stove. Do you know where I might purchase one? Or do I need one at all? I have a cornflower blue tall pot with a metal rim, metal spout and a black handle. However, the metal rim looks like it was pulled together and it has 2 visible screws. Is this model a recall? I didn't notice any mention of screws in previous comments. Thank you in advance. I have a floral p149 9 cup stovetop percolator. Never been used, I was wondering if this particular model came with a basket lid, as mine does not have one...thanks! The lid of the P-149 attaches to the basket and acts as the basket lid. My percolator is the exact same one as in the picture above, p149, and does not have a basket lid. Is this how the model originally came? Or am I missing a part? Yes you have all the parts. These models (P-146 & P-149) do not have basket lids like the previous models. The pot lid attaches directly to the basket. Is the 10 cup P-149 safe? Above on your data sheet it states the 9 cup was part of the recall but does not mention the 10 cup P149. 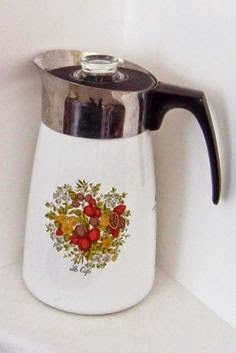 I still use my great grands Floral Bouquet patterned, 6 cup electric percolator. It makes the BEST coffee.